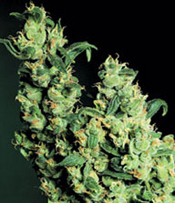 Growing: Easy to moderate By cross breeding select and excellent marijuana strains, Jack Herer is produced. This variety from Dr. Hempâ€™s Seeds is an indica and sativa hybrid that is best grown indoors. It can also adapt to different growing techniques preferred by expert growers like SOG and other super cropping techniques. It grows tall and can easily reach 6 feet in just a short time. Flowering time for Jack Herer can be expected once it reaches 60 days. This hybrid is a prolific producer of buds that are compact and teeming with lots of sticky resin cascading even down to its stalks and leaves. Yield is pretty decent and the grower can expect to harvest around 550 gr/m2 of potent hybrid cannabis buds. The effect when smoked is a combined strength of sativa and indica which means getting the best of both worlds in terms of being high and stoned at the same time.